Author’s note: This week, I’m doing something I’ve done only once before during the course of writing for this Nearing Midnight column. I’m repeating a commentary I wrote previously –this one on January 16, 2006. I am doing so because I believe the Lord impressed upon my spirit that the Departure is so very near, and our minds and spiritual hearts are too often far from that stunning event that can take place at any given second. It’s time to “look up” is the exhortation of the hour. “Now the Spirit speaketh expressly, that in the latter times some shall depart from the faith, giving heed to seducing spirits, and doctrines of devils”(1 Tim. 4:1). Dark, spiritual forces in high places are at work. There is no groundbreaking revelation in that statement regarding life in this nation and the world today. However, the true nature of the demonic delusion being foisted upon us is something even the most biblically mature among us will continue to miss─I’m convinced─if spiritual antennae aren’t properly attuned. Additionally, it is time, like no other time before, to put on the whole armor as outlined by the apostle Paul in Ephesians 6:12-18. Even more profound than the political insanity of the lunatic left that splits America, I perceive a most troubling schism developing amongst the brethren. I refer to those who watch –like the Lord commanded (Mark 13: 37) — end-times developments in what many believe are the closing hours of the Church Age. Reports, leading up to this presidential election, came at us on an increasingly regular basis of behind-the-scenes activities that appeared to be─to say the least─bizarre. I’m talking about things the equivalent of claims/reports of the U.S. Government actually planning and carrying out the assassination of John F. Kennedy,─of George W. Bush’s administration being behind the planning and attack on the World Trade Center towers on September 11, 2011. I’m certain that, over recent years, the reader of this essay has read the many articles of such mind-boggling reports─all written/presented as if they were unassailable truth. These accounts sprang from unseen fly-on-the-wall sources that gave the impression they personally witness the making of plans to imprison believers or to implant us all with computer chips while we sleep, or…whatever the conspiratorial imagination might conjure. I will already have angered those who send such email with that word-portrait, no doubt. But before my thoughts on your side of the issue raise the blood pressure with words of anger, “I’ll never send him another article,” please hear me out. There is the other side of the developing schism. It, too, is deleterious to the task of being a watchman on the wall in these critical days leading up to our Lord’s catastrophic intervention into the affairs of mankind. I’m talking about the mindset that writes off as complete lunacy every report issued by the likes of Alex Jones crossing their computer screens. To fold up the antennae of discernment and simply lump all things that don’t slip smoothly through one’s anti-conspiratorial filter, just might, in my view, constitute a deadly delusion in the making. The rift, I sense developing between the watchmen during these fleeting days of the age is, inflicted by the father of lies, himself. It is all part of the great, spiritual, wrestling match Paul warns about in Ephesians 6:12. The devil likes to pit one side against the other, and it is easy for him to do, if the spiritual armor isn’t the battle gear of choice. One side of the divide most often sees only collusion of governmental diabolists at every level, thus is, understandably, accused by the secular world and fellow Christian watchmen alike of being: conspiracy kooks. The danger we face in this hour of apparent triumph, with the new presidential administration now in place, is that Christians on each side of the divide, out of apathy, sometimes fail to recognize the ways Satan directs his human minions to plot his end-times mischief. Paul, mentioned at the beginning of this piece, must have, with his words of Ephesians 6: 12-18, been given his inspired thought particularly to give to this generation so near the return of Jesus Christ. Each Christian should daily put on the whole armor of God. This, obviously, hasn’t happened, and likely won’t happen. The vast numbers within the body of Christ are turned inward, or in directions other than watching and yearning for the Lord’s coming back to put an end to this evil world-system. If we are honest, we must say that the body of Christ, as a whole today, isn’t even pursuing the Great Commission left to us by Jesus─to carry the gospel to the whole world and to do whatsoever He taught and instructed. Let’s not wrestle violently, angrily against each other, but combine, with reasoned purpose, against our true foe. Here is how to dress for the battle that will surely grow more intensive by the hour as the Rapture of the church approaches. “Wherefore take unto you the whole armour of God, that ye may be able to withstand in the evil day, and having done all, to stand. Stand therefore, having your loins girt about with truth, and having on the breastplate of righteousness; and your feet shod with the preparation of the gospel of peace; above all, taking the shield of faith, wherewith ye shall be able to quench all the fiery darts of the wicked. “And take the helmet of salvation, and the sword of the Spirit, which is the word of God: Praying always with all prayer and supplication in the Spirit, and watching thereunto with all perseverance and supplication for all saints” (Ephesians 6:10-18). Terry James commentary on two important books concerning Israel in these critical days. This is a statement I have made in one form or another in most every book I’ve written. It is as if that most volatile point on the globe is like the magnetic north is to a compass. The needle’s tip can’t resist the tug God’s chosen land presents. One senses, if attuned spiritually while watching the times around us unfold, that the world is on the precipice of truly prophetic movement. Observers of the American presidential election process of 2016 were for the most part stunned by the election of Donald J. Trump. Shock waves so shattered the polling-predictions and punditry-prognostication that political and social equilibrium continues unrecovered. Our national environment quivers and reels under the anger and anxieties of those who expected a different outcome of the election in which they believe their worldview was unfairly defeated. There is no doubt—in this writer’s view, at least—that this election turned out as it did, with Trump becoming president because God intervened. I do believe wholeheartedly that 2 Chronicles 7:14 helped bring about the intervention. However, this is not because America is a godly nation or that Mr. Trump is a godly individual. But the dramatic shift in direction the United States is in process of taking, I’m convinced, portends prophetic developments beyond what most believers might consider. Prophetic movement, I believe, will, from this point forward in 2017, shape America and the world in ways no other generation has experienced. Attention at the moment is concentrated—the cameras are turned—on hatred of the man God has raised up for this hour. There can be scant denial that the forces of globalism, liberalism, and news and entertainment media, D.C. establishment-types and even some corporate entities in America are bent on destroying this presidency. However, those cameras and microphones are about to turn dramatically back to capture issues and events of far greater import. I believe we are on the cusp of seeing the world truly being shaped for the wind up of the Dispensation of Grace—the Church Age. Israel is about to again step front and center upon the world stage. This year and beyond will perhaps bring the prophet Zechariah’s foretellings about God’s chosen nation in to focus as never before. The new president has said he is seriously considering moving the American embassy in Israel from Tel Aviv to Jerusalem. This action, alone, will, if it eventuates, likely cause Middle Eastern ramifications we can’t totally foresee. Mr. Trump’s expected embrace of Israel and its prime minister is exciting to think upon, but troubling in its prospective results. Next year marks the 70th anniversary of Israel’s rebirth into modernity. Might that year bring the ratcheting up of prophetic stage-setting? —For the Jewish state’s starring role as the Lord brings mankind’s rebellion to a head? Dr. Thomas Ice, the foremost scholar on matters involving the Pre-Tribulation Rapture view, is a long-time friend and colleague. There is no one, in my opinion, who possesses a more in-depth knowledge of Bible prophecy, particularly as it relates to Israel. If we are to grasp the true meaning of prophetic developments exploding upon the scene day by day, it’s essential that we look intensively at Bible prophecy as given in God’s Word, the Bible. Again, there is no person of whom I’m aware more qualified to break God’s prophetic Word so that it can be understood in terms of where we stand on His Prophetic Timeline than Dr. Ice. I’m excited and pleased to be among the first to be given opportunity by his publisher to offer you—in a very special package—a book that is one I’m convinced the Lord is providing at this crucial moment. It is a volume that every believer should read in advance of what is going to be, in all likelihood, tumultuous years ahead for Israel, the Middle East, and for the whole world. “The modern state of Israel has been a nation for almost 70 years. When she was formed, and fought her early wars of existence, most Bible-believing Christians believed there was a real connection with what was going on in the Middle East and Bible prophecy that predicts an end-time return of the Jews to their land. While support for Israel remains high in most evangelical communities, we are seeing the beginning of a decline, especially among younger evangelicals, who question whether modern Israel really relates to end-time Bible prophecy. -Explores the prophetic nature and future of Israel. Dr. Arnold G. Fruchtenbaum, in my opinion the foremost scholar on Israel today from the standpoint of Bible prophecy, gives Ice’s book high marks indeed. New Leaf Press Publishing Group is presenting Dr. Thomas Ice’s book in a very special package—and at a low price—for our Rapture Ready family. 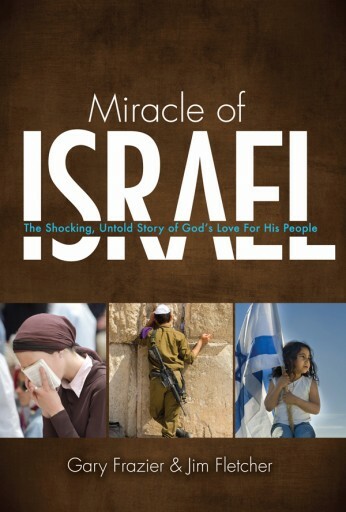 Miracle of Israel: The Shocking, Untold Story of God’s Love for His People by Gary Frazier and Jim Fletcher is a book I’ve written about before. Both Gary and Jim are great writers who I’m thankful to call friends. Jim, a superb investigative journalist, and editor, of course, writes our weekly column on Israel, about which I receive compliments over and over. Gary is one of the most knowledgeable Bible teachers, lecturers, and frequently interviewed experts on Bible prophecy. Together, he and Jim have produced a book that should be in every home library. Israel, as Dr. Fruchtenbaum wrote above, should be thoroughly understood by Christians today. This book, in tandem with Dr. Thomas Ice’s book, will go a long way toward providing the depth of understanding needed as we face these next years that are bound to be fraught with prophetic stage-setting realities. Authors Frazier and Fletcher invite the reader to join in watching God’s hand as He directs these closing years of the age. “Remember the former things of old: for I am God, and there is none else; I am God, and there is none like me. Declaring the end from the beginning, and from ancient times the things that are not yet done. saying, My counsel shall stand, and I will do all my pleasure. These are two truly outstanding books that can help immensely in your study of Bible prophecy. I highly recommend this special offering of two great volumes in one package at a great price. Another thing to consider is that Rapture Ready will receive a part of the price of the book offer, meaning you will help contribute to funding the site by buying the package. As you know, we have had the site completely reworked to bring it into the age of the highly-advanced devices now available. This will give Rapture Ready an even greater reach for our Lord’s great cause. The work on the site wasn’t without considerable cost. We will appreciate any funding help, as always. From now until March 31, you can take advantage of a very special offer. You can purchase this two-book pack: The Case for Zionism by Thomas Ice and Miracle of Israel by Jim Fletcher & Gary Frazier for only $20 (this includes free shipping). 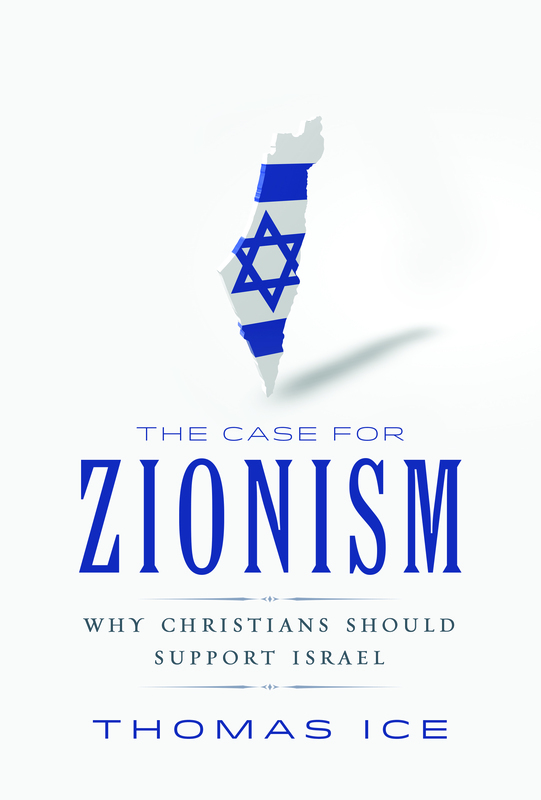 Follow this link to order—> http://www.nlpg.com/the-case-for-zionism-info. Just beneath the boiling surface of seething hostility there can be sensed a moving and shaking. Talk of the building of a Jewish temple atop the Temple Mount is beginning to escape into the back-channel atmospherics of the Mid-East misery. How can such not be the case? Every direction the student of Bible prophecy looks, stage setting for the final act of this quickly decaying age is already on the scene. God’s land is being further divided (Joel 3:2), which portends God’s bringing all nations into the Valley of Jehoshaphat─to Armageddon. The Roadmap to Peace is being dusted-off and reintroduced as the blueprint for peace and safety for not only Israel and its blood-vowed enemies, but for the whole world, as insulation against the initiation of World War III. The European Union (EU) is in turmoil. It is turmoil, however, that seems to have a smelting effect, preparing the iron of the legs, feet and toes of Daniel’s interpretation for Nebuchadnezzar — into their end of the age configuration. Technological wizardry of every description has made possible the bringing together of all peoples of planet Earth into one world─the New World Order, so desired by the globalist powers that be. The economic upheaval experienced by most every nation cries out for a master manipulator that will institute an electronic funds transfer system in order to bring stability and order to the financial distress and perplexity that bedevils presidents, potentates and dictators. Such a man can’t be too far into the shadows of emerging world togetherness. On the forefront of religious change is the call for a melding of every form of pathways to Heaven. The pope and Islamist Imams seem to be forging a synthesis of sorts in discovering many ways to God, a thing unheard of until very recently. Protestant America in large part seems not oppose the feelers crawling toward their forms of Christianity. So-called Chrislam is appealing to them, and ecumenism beckons with allurement at many levels. So, with all of this and much more going on, the talk of the building of a Jewish temple should surprise none of us. It is a key ingredient in the coming Tribulation mixture within God’s cup of wrath. The talk of late on the possibility of a Jewish temple in the making revolves these days around the words of a Jewish Rabbi. The Nascent Sanhedrin is calling on Russian President Vladimir Putin and US president-elect Donald Trump to join forces and fulfill their Biblically-mandated roles by rebuilding the Jewish Temple in Jerusalem. This train of thought, of course, conforms to the long-held opinions of some within the universe of those who observe matters involving plans to build a Temple on Mount Moriah. Bible prophecy foretells, through the vision given John, God’s Hand on the Tribulation temple. “And there was given me a reed like unto a rod: and the angel stood, saying, Rise, and measure the temple of God, and the altar, and them that worship therein. But the court which is without the temple leave out, and measure it not; for it is given unto the Gentiles: and the holy city shall they tread under foot forty and two months” (Revelation 11:1-2). During the Tribulation era there will definitely be a temple sitting where Solomon’s Temple sat. There is more than enough room surrounding where the temple must reside for the Muslim shrines to sit. There is a ton of chatter going on about all of this within the Bible prophecy community. Many voices within this blogosphere hold that those Muslims who seem to be letting it slip (that Israel’s Arab-Islamist enemies might be willing to talk about accommodation of a Jewish Temple) must never be trusted. It is all being done for some surreptitious evil known only to the Imams and to the master architect of their evil blueprint─Satan. The very fact that there is talk coming from Israel’s enemies about the heretofore, unthinkable possibility of allowing a temple on Mount Moriah is significant, I think. A phony─and deadly─peace is at the center of Satan’s blueprint for usurping the throne of God on earth. We can know this from Daniel’s account of the covenant Antichrist will confirm, assuring peace for seven years (Daniel 9:26-27). Also, Isaiah the prophet says so, (Isaiah 28:15, 18). Satan intends to place his “messiah” right on the spot where the Holy of Holies sat, where the Ark of the Covenant resided within the Temple of Solomon’s day. So, I believe it is reasonable to look for the possibility of a rebuilt temple to become increasingly, front and center in news and blog-chatter as the age draws to a close. In the halls of government, we have the likes of Democrat Senator Charles Schumer weeping on the Senate floor. He tells sobbingly how it breaks his heart that the few people are detained at the airports because of President Trump’s temporary ban of people coming in from the seven nations Schumer’s own Democrat President Obama put on the banned list several years ago. The senator, himself, wholeheartedly backed the banning of such entrants into America under Obama’s executive order. Something big is up. One can sense it in one’s spiritual bones. God has Trump here and at this time for some great purpose.